Some exciting young jazz musicians have been coming out of Birmingham in recent years, and one name to watch is that of Devon-born Ben Lee. 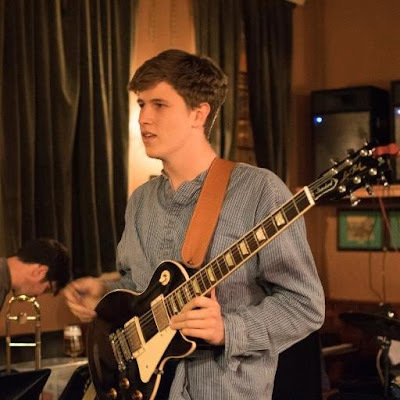 The up-and-coming guitarist and composer is the founder and leader of the Ben Lee Quintet (playing alongside Chris Young on alto sax, Richard Foote on trombone, David Ferris on organ, and Euan Palmer on drums). They are just about to release their debut album "In The Tree" on Stoney Lane Records. He spoke to Leah Williams about the inspirations for the album, his love of sci-fi and travel, and his recent move to London. 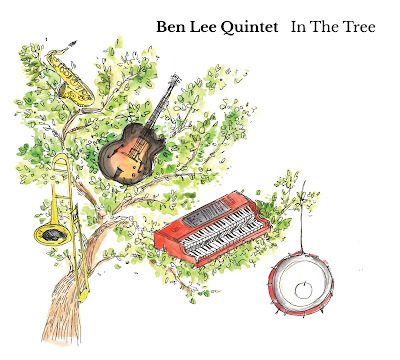 LondonJazz News: How did the Ben Lee Quintet come into being? Ben Lee: It actually evolved out of a quartet I played with when studying at college (Ben studied at the Birmingham Conservatoire). One of my friends Dave Ferris moved from playing the piano to concentrating more on the organ and we just started jamming and finding some really great sounds. He joined the band and I remember we did one particular gig with all five of the current line-up together and it just really clicked. So we’ve been playing together since then, which was about 18 months or so ago. LJN: And now you’re releasing your debut album - you must be pretty excited? BL: Yeah, it’s great. We actually recorded that album last year just before Christmas and were so happy with the way it turned out. It was amazing when Sam Slater from Stoney Lane Records picked it up. LJN: For people who haven’t heard any of your music, what kind of thing can they expect from In The Tree? BL: I think it’s pretty eclectic music, with a sense of humour running throughout. Being a guitarist, I’ve always loved rock music and so I think this album does have a certain rock flavour to it but without being too heavy - it’s definitely meant to be fun primarily. LJN: You played an album pre-launch gig at King’s Place last month, how was it? BL: It was really fun. The room we were in was so great. Rarely do you get to play in a space where you can hear all the other musicians so well. We had a bit of drama to kick it off actually because Dave’s organ broke during the soundcheck and the replacement only arrived about a minute before we were due on! It actually worked out for us because it put everyone in such a good, celebratory mood before we’d even begun playing! The energy was really high throughout, with the highlight probably being playing one of the tunes from our album with the Jonathan Silk Big Band who were playing the 2nd set that night. It was quite an amazing experience with all 25 or so of us on stage together and hearing the track Beginning Of The End, which I composed to have a kind of dystopian novel type epic feel, played on such a scale was a really great moment. LJN: All your compositions seem to have pretty interesting and unique stories behind them! You’ve obviously travelled a lot - do you find that’s a great source of inspiration? BL: Yeah I’ve done a fair amount of travel over the years, both for music and for other reasons. I wouldn’t say it’s a conscientious decision to turn these experiences into the basis for my music it’s more just that you naturally encounter so many different ideas in everyday life, no matter where you are, and the tunes from this album have just been born out of those things I happen to have engaged with over the last few years. LJN: So how did you come across Hygge (an un-translatable Danish word loosely meaning cosiness, creating a warm atmosphere and enjoying the good things in life with good people) that features as a track title on your album? BL: It was actually last year when Hans Koller invited us along as guests to a Winter Jazz School he was running in Denmark. It was a great experience filled with awesome music, great food and keeping warm away from the January cold. It was pretty much the embodiment of the word Hygge - which is an atmosphere of cosiness and acceptance shared with other people. It obviously made quite an impression on me! LJN: Apart from your everyday encounters, sci-fi interests and other life influences, do you have any particular musical influences that went into this album? BL: So many. I’ve been a lifelong fan of Wes Montgomery’s music. I just love listening to him; it always seems to me that he’s smiling when he plays. I feel a great connection to his music and it’s definitely been, and still is, a huge influence. Other guitarists I really love and listen to a lot are John Scofield and Grant Green. I’m actually listening to a friend’s band at the moment, called Delta Autumn - I get a lot of inspiration from listening to and playing with friends and other musicians. LJN: So you’ve recently moved to London - does this mean we can expect to hear more from you? The Ben Lee Quintet will be at The Green Note in Camden on 8 January 2017 or at various other venues around the UK from 10 November, with support from the Arts Council.